Magic the Gathering “Competitive” EDH Primer: Breya, Etherium Sculptor Artifact Combo? I’m here to talk about my favorite commander to build around in EDH. Breya, Etherium Sculptor might be the most flexible combo/control commander in the game right now. Her flexibility comes from various elements: (1) unconditional removal at instant speed, (2) an infinite mana outlet, (3) a value engine, (4) and life gain (write something snarky). 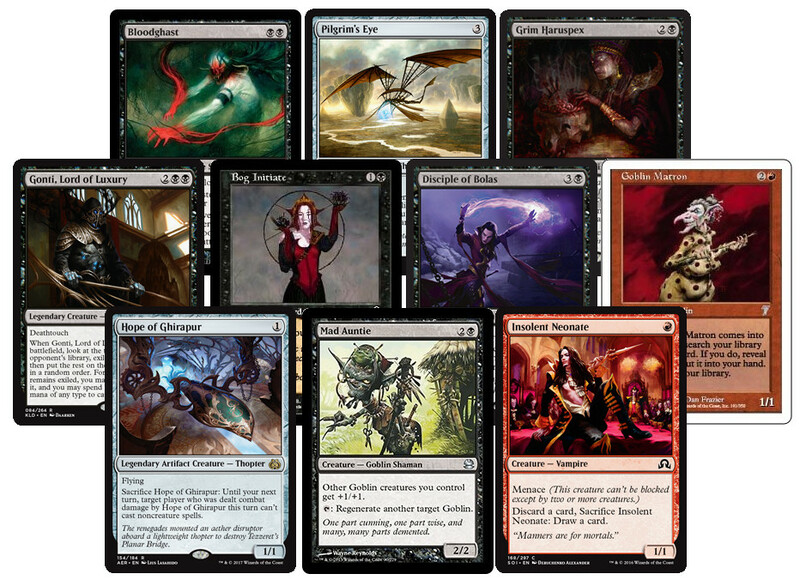 Beyond this you get access to the colors that an aspiring artificer dreams of, giving you cards like thopter foundry (esper card) and scrap mastery/daretti (monored cards) in the same deck is absolutely fantastic. In addition, Breya is also just a really great body–4 mana for a 4/4 with 2 1/1s is so above rate in EDH that once you cast Breya it’s very unlikely for you to get attacked after that. Also look at that art. In this article I will talk about how I like to build breya (more inconsistent and janky), and a non competitive thopter tribal build at the end. Firstly let’s go through Breya herself. Breya is a 4 color (non green), artifact creature, that summons 1/1 thopters when she enters the battlefield. She has 3 abilities that require an activation cost of sacrificing 2 artifacts: deal 3 damage to a player, give a creature -4/-4 until eot, and gain 5 life. The most common play pattern with breya is play her on 6 mana and leave up mana to kill a creature at instant speed, looking at one of the previous deck techs on this blog, Grenzo, Dungeon Warden almost just folds to that play pattern. But there is so much more. Her next ability, deal 3 damage to target player, is the win condition of this deck,. This is where it gets a bit complicated. You see breya herself is an artifact creature, so she can sacrifice herself. This means that with infinite colored mana the deck wins on the spot, because you can just sac breya and a thopter to recast breya and deal infinite damage to every player. It also means that combos like nim deathmantle with Ashnods Altar/Krak Clan ironworks are also instant wins. Her last usefull ability is her enters the battlefield effect, make 2 1/1 thopters. This is a massive effect for cards that care about hitting your opponent, providing chump blockers (which often gains you more life than if you sacrificed them), and most importantly sacrificing them to skullclamp, essentially turning breya into a 6 mana draw 4. Her final ability, gain 5 life, is situational at best, only really good when you have a card like necropotence or ad nauseam. How I build the deck. 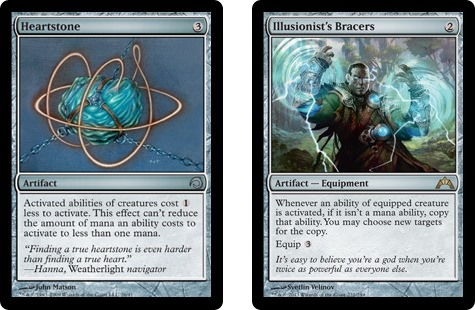 The biggest concept that makes my breya deck unique is my focus on one huge theme, making salvaging station and artificer’s intuition appear not just good, but broken. 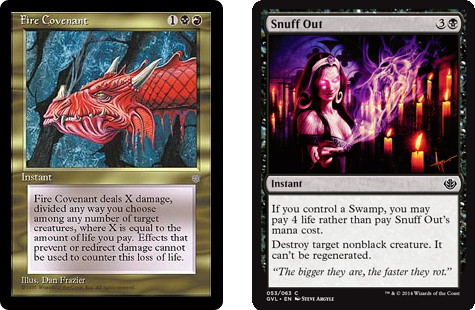 Essentially the combination of these two cards in this deck is equivalent to survival of the fittest plus recurring nightmare, a massive recursion plus tutor engine that wins games by itself. 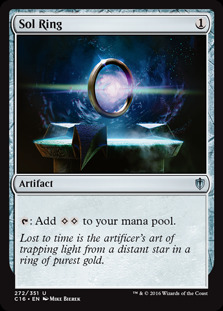 As such, there is a large focus in this deck on artifacts that cost 1 mana or less with around 10-15% of the deck being made up of these trinkets. The next biggest concept in the deck is this set of cards (open the vaults, faith’s reward, scrap mastery, second sunrise) Yes, this is an eggs deck, albeit a tame one. Lots of wins will come from sacrificing your whole board, and then casting a massive open the vaults that nets you like 20 mana 6 draws, and hopefully a way to recur your mass reanimation spell. I personally love this way of winning the game, it feels powerful to grab your graveyard and just dump all of it onto the battlefield, the perfect combination of a timmy feeling with a johnny combo. Another key element of my version of breya is its control elements. The deck runs six counterspells, four board wipes, 4 targeted removal spells (including breya herself), That’s around 25% of the spells in the deck being devoted specifically to disruption. And if you count the approximately 10-15% of the deck that’s devoted specifically to card draw and tutor it’s pretty reliable that you can stop the opponent from winning. Standouts from these categories include Merciless Eviction, which is the second best boardwipe in EDH outside of Cyclonic Rift in my opinion, mostly because of how often it’s a one sided mass exile for the most problematic category of permanents that you are facing. The counterspell suite is geared towards either costing one mana (mostly so you can force through whatever it is you are trying to do even with constrained mana), hitting every type of spell possible, or at the very least drawing a card(because if you set yourself and an opponent back you are oftentimes helping the opponents you aren’t countering more than yourself, at least with Arcane Denial and Dream fracture you aren’t setting yourself back). So, let’s go through how this deck wins. Almost every combo in this deck will involve some combination of Krark-Clan Ironworks and a mass recursion spell (Scrap Mastery, Open The Vaults, Second Sunrise, Faith’s Reward), mostly because if you have any number of artifacts with a beneficial effect you can often win off of the 20-infinite mana that you generate. Say you have 5 artifacts that draw a card when they go to the graveyard and 3 artifacts that do literal nothing, then Krark-Clan plus a 5 mana mass recursion spell becomes draw 5 cards get (18-5-4=11 mana) then have Krark-Clan and the artifacts back in play getting you another 18 mana and another 5 cards. Now you’ve drawn a 10th of your deck and have 29 mana which means you can likely find another way to bring back all your artifacts or if you find a Codex shredder you just win on the spot because you infinitely recur your mass recursion spell. 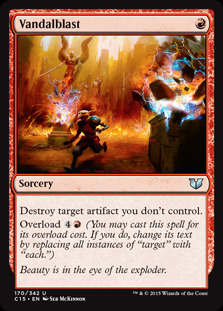 At that point if you have the colored mana which you should have because you’ve been drawing a bunch of artifacts that make mana you should be able to repeatedly recur Breya and ping everyone to death. Key cards that makes this combo nuts. Artificer’s Intuition-if you have a hand with artificer’s intuition in this deck you keep it no matter what. This card finds you artifact lands, sol ring, nihil spellbomb, skullclamp, artifacts that draw cards, fills your graveyard with reanimation targets, basically if you have this card in play it feels very hard to lose unless your opponent is playing a very hateful deck. Ichor Wellspring-An unassuming card, it basically draws 2 cards off of every time you cast a mass recursion spell, this card often times is the difference between your open the vaults comboing off and doing nothing. Sacrifice the Sword to the Foundry -> Sword returns the battlefield. Basically means that every mana you have turns into a 1/1 flying thopter and 1 life. Combo also works if you have thopter foundry in play and sword of the meek in the graveyard and another artifact in play. Tap sol ring for 2 colorless, sac sol ring to thopter foundry (1 colorless, 1 thopter), return sol ring to the battlefield with salvaging station and tap sol ring for mana (3 colorless, 1 thopter), sac sol ring to thopter foundry (2 colorless, 2 thopters), attach skullclamp to thopter untap salvaging station and return sol ring again and tap it (3 colorless, 2 cards, 1 thopter). The combo draws your deck and nets a large amount of colorless mana. This is the main back up plan if your Krark-Clan Ironworks gets exiled. Yugioh April 1st 2017 TCG Banlist Reaction: Is Zoodiac PePe 2.0? Tfw you try to get your guest writers to do this post for you, but then they’re all busy so you gotta do it yourself. Anyway, the TCG FINALLY after almost a 6 months got its new banlist. Heads rolled, money was lost, people cried and once again we were forced to bow before the tyrant Komeny. The Tyrant Neptune: This card is part of an FTK combo with the Lyrical Luscina fusion monster. It’s interesting that the TCG preemptively banned it, but it’s not that surprising given how much Konami hates FTKs. Vanity’s Emptiness: Best thing to ever happen. This card has stolen games, caused salt and been relevant for way too long. It’s generally the last piece to any unbreakable board (because don’t let the memes fool you, almost nobody actually plays Ra Sphere Mode). I am very glad to see it go. I will miss this card. There was a time when Maxx “C” was a counter to unfair special summon spam decks, but now its just another card to provide an unfair card advantage while preventing plays. That being said limiting Maxx “C” to 1, just makes it infinitely sackier if you actually open it. I could see it getting banned some day. Rescue Cat*: Rescue Cat has been errata’d to be once per turn and to negate the effects of the monsters that it summons. This still reads essentially as a 1-card xyz or synchro (as there are a billion beasts that it can summon at this point). Whether or not that’s broken still remains a question. Brionac, Dragon of the Ice Barrier*: Brionac is now once per turn. Once again if this is broken or not I don’t know. Brain Control*: Brain Control with its errata to only take monsters that can be normal summoned is terrible. It won’t see any play and will likely go to 3 in no time. Future Fusion*: This card can mill all of the Infernoids in the user’s deck to the graveyard..
It’s been errata’d to not send until the following turn, but its ceiling is still too high. It will be banned again eventually (I think so at least). Wisdom-Eye Magician: Thank goodness they’re giving Pendulums support before nerfing them to death in Link Format. This won’t do anything except maybe help sell the last pendulum set they’re releasing. I doubt that will happen though. So you basically can’t build the best deck in yugioh anymore huh? This isn’t as bad as the adjusted ban list, BUT let’s see here. Perhaps no deck in Yugioh can remain tier 1 (or 0). That being said it’s pretty clear that no deck can be tier 0 for very long these days. Reasonable since everyone is more or less siding Kaijus to combat established boards. Oh before we get started remember that the OCG is almost 2 formats and multiple packs ahead of us. We won’t see a banlist like this until likely the Winter of this year. The Tyrant Neptune (Unlimited to Forbidden): This card was being used in an FTK combo with Lyrical Luscina Independent Nightingale. Konami hates FTKs (especially burn FTKs). It’s easy to see why this card got banned. Zoodiac Drident (Unlimited to Forbidden): The first hit to tilt all viewers is the banning of the Zoodiac boss monster. This has killed the deck’s top end threat. Without Drident, the deck can no longer effectively react on the opponent’s turn. Zoodiac Barrage (Unlimited to Forbidden): So this was the card I think deserved to get hit. Zoodiac Barrage essentially gave you access to 6 copies of Ratpier. Since that little bugger is a 1-card combo to swarm the board this needed to be stopped. Furthermore, virtually all of the Zoo variants abused Barrage’s destruction effect in a manner not originally intended (one would hope). Barrage also allowed you to keep going after your normal summon or first special summon was disrupted. All in all it was the most infuriating in the Zoodiac deck, which I fully support being banned. Witch of the Black Forest (Forbidden to Limited, Text Change): We don’t know what the errata is, but it’s likely the exact same as Sangan. That much beloved furball is at 3 in OCG and no one plays him. We can assume Witch will share the same fate. Zoodiac Ratpier (Unlimited to Limited): Now this was unfair. Without Ratpier, Zoodiac goes from being a consistent, powerful deck to a bizarre entourage of fringe use trash monsters. I mean Throughblade and Whiptail are good, but they don’t come close to what Ratpier does. Now to be fair, I think limiting Ratpier was completely reasonable. It’s just that its limitation alongside banning Barrage/Drident is just incredible overkill. Blackwing – Gofu the Vague Shadow (Unlimited to Limited): It’s been a long time since a Blackwing graced the banlist. After watching a few link summoning combo videos online I can safely say that Gofu is more broken than ever perform. Thank goodness they limited it. Interrupted Kaiju Slumber (Unlimited to Limited): From a card design standpoint Kaiju Slumber is absurd. It takes the one of the best cards in the game (Dark Hole) and essentially adds get a 3300 attacker. The fact that you have to summon a weaker Kaiju to your opponent’s field generally doesn’t matter since you just theoretically wiped their board. To play devil’s advocate for a minute, like with Brilliant Fusion Kaiju slumber forces you to play multiple non-synergistic cards. If you open multiple Kaiju, even if you summon both to the field the kaiju slumbers in your deck become dead. However, even with that Kaiju are a polarizing subject in Yugioh. Many (like myself) believe they’re a godsend preventing unbreakable boards, while others think they’re ruining the game. Anyway, Kaiju Slumber is still dumb and it’s being banned is reasonable. Elemental HERO Stratos (Limited to Semi-Limited): We’ll never have Stratos free. If you think he will be, you’re lying to yourself. Armageddon Knight (Limited to Semi-Limited): It’s a good card. It’s a combo piece. I’m sure there are ways to break it, but Dark Synchro is probably dead in Link format (I’d assume). Fairy Tail – Snow (Unlimited to Semi-Limited): This card is broken. With this card limited, it pretty much nerfs Lawnmowing/Lightsworn decks. Snow is very powerful as it provides both disruption and a body. Try killing your opponent through a Fairy Tale Snow… try even making a board through a Fairy Tale Snow. Good hit Konami. Ignister Prominence, the Blasting Dracoslayer (Limited to Semi-Limited): This card is powerful, but Pendulums are dead now so it doesn’t matter. Brionac, Dragon of the Ice Barrier (Limited to Semi-Limited): It’s a good day to get back this iconic card with an errata that doesn’t make it unplayable. Fire Formation – Tenki (Limited to Semi-Limited): It’s ok, killing Zoodiac had to come with killing Yosenju, Fire Fist and literally all other Beast-Warrior decks. 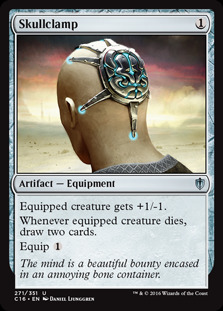 Brain Control (Limited to Semi-Limited): With the errata, it’s unplayable. Artifact Moralltach (Semi-Limited to Unlimited): Bring back this mans in TCG, he’s no longer broken. Artifacts are literally just him, Scythe and maybe Lancia. I don’t even think it’ll see play at 3. Magician of Faith (Semi-Limited to Unlimited): We all love her, we’ll all never play her. Nuff said. D/D Lamia (Semi-Limited to Unlimited): I guess D/D/D had to be freed? I don’t think this matters, but I guess it’s here. And that’s the list. I feel bad for Zoodiac. The deck is totally dead after being tier 1 for months. Like Dragon Rulers, Nekroz and Burning Abyss it’s going to fade into Yugioh history. Thanks for reading as usual. Yugioh ARG Atlantic City YosenZoo Kaiju Deck Profile and Tournament Report Good Synergy or Horrible Mistake? Two friends went to ARG Atlantic city playing their homebrew deck Yosenju-Zoodiac-Kaiju. Each played the exact same list. How did their tournament go? The reason behind why I ran this deck is that I wanted to run the best deck that required 0 thinking or time commitment. This was the most consistent and required least amount of thinking throughout the whole day, which was my main goal. Myself and a friend of mine played a nearly identical main, side and extra deck. Today I played Yosenzoo Kaiju, a deck that was designed specifically to go second and OTK (since every deck this format wanted to go second, and most didn’t play mirror force traps). Main-decking 4 board wipes, and multiple ways to 2-card combo, the deck specialized in making the typical zoo combo but overlaying for Tiger King instead of Daigusto Emeral, and setting Fire Formation Tensu, allowing the Yosenju engine (which you search off bullhorn because they’re beast warrior) to completely go off. In a lot of testing, we left the main deck at 46 to try and mitigate lawnmowing mills and we felt that (also running pot of desires) there was not a single card we could cut to make room. Any way of summoning rat and a slumber OR Zoo and 1 Yosenju and Raigeki or kaiju and zoo and 1 Yosenju. It’s same as zoo setup, except you search a Yosenju with Bullhorn and then make Tiger King with the 2 rats to set Tensu (or Tenki if you used Zoodiac Barrage) and Yosenju swarm. This is probably the fastest match I’ve ever had in my life. It was a total of 4 turns, and ended in less than 5 minutes. He went first and opened standard zoo combo, made Emeral+Drident and set 2 passed. I draw for turn with an opening hand of Tenki, Twin twisters, Kama 1, Kama 2, Kama 3, and Slumber. I twin twister ditch Kama 3 to which he reveals my body and chalice. I then slumber, search Kama 1 with Tenki, and then summon Kama’s 1,2,3, bounce my opponent’s kaiju back to my hand, and then attack for game for a total of 2 turns. Game 2 he opened very similar, and I opened slumber zoo for the combo, ending the match in 4 turns. Game 1 he wins die roll and goes first, setting up a board of decatron (with Devyaty-negate monster-effect), Drident, Rafflesia, and Totem bird. I Kaiju the Totem bird, slumber, and then OTK with Barrage and 2 Yosenjus in hand. Game 2 He goes first again and sets up a similarly unbreakable board. I don’t draw slumber so it’s harder to bait out/break, but I set myself up (backed by storming mirror force) to not die. I survive the turn because storming mirror force is broken, and all I need to do to swing for game (he was at 300 life) was topdeck any monster. I draw a dead Tensu, set it, and wait for him to kill me as long as he didn’t’ mess up. Game 3 I draw Maxx c Lancia going second so there was just no way I was losing, especially when he left arm offering’d his hand for an instant fusion to bring back zoo. He took the maxx c challenge and I drew 6 cards, Slumber’d for game and held Forbidden Chalice in hand for Fairy Tale Snow. Game 1 I bricked double Chalice, Tensu, Raigeki, Kama 2, Kama 3. I cleared his board but got hit by Solemn Strike to my Kama 2, by which he had enough resources to otk me next turn. Game 2 I pulled off the yosenju combo and won. Game 3 He opened an unbreakable board and I had no board clears. Next to Paleo, this is my second-to-worst matchup, as I simply lose to a board that they can bring back next turn if I can’t otk. Game 1 his opening board was Majespecter Kirin, Totem bird, Drident, Emeral, Metalfoes Counter and a Fullmetalfoes Fusion set. I Kaiju’d totem bid and slumber’d, but he chained maxx c and I couldn’t OTK with Kirin on board and the maxx c/fullmetal combination. Game 2 I elected to go first (my 3 strikes and 2 barriers in the side were for against pendulum-based decks and Paleo) but drew none of the 5 traps that I sided in, even after desires for a 6-card opening hand. Game 1: He went first and apparently, this deck turbo makes Elder Entity Norden, fusion substitute, and draws 4 cards. I didn’t have twin twister and he had double strike barrier set. Game 2: I OTK’d with the combo. Game 3: He opened the nuts again and I couldn’t contest. Game 1: I surprised him with the OTK. Game 2: Given limited options, I had to go for the OTK, even chalice-ing the scythe, but I had no idea he ran Drowning Mirror Force, which ended up winning the game for him. Game 3: A bit of a grind because I bricked, but stalled out long enough to kaiju Crystal wing, slumber, and OTK. I only played Round 6 because my friends were finishing up a side event, I ended up giving my opponent the win and dropping. Looking back: Nothing can keep up with the consistency and the 1-card combo that zoo requires. Nor the strikes or mirror forces that I couldn’t twin twister enough of. I can live with Drident, but Kirin, strikes and barrier still hurt. MVP of the day: Storming Mirror Force. Nearly every time I drew the card I won the game, or it saved me from losing badly when I bricked. It’s just way too strong. LVP of the day: Juragedo. I was originally going to play Yosenju Tsujik, but I couldn’t find one (because honestly who owns that card) so I tried to replace with Juragedo. In theory, it helped beat over drancia if they popped rat since it special summons during battle phase, and it’s essentially a swift scarecrow I draw into to prevent getting OTK’d with an open board and running only 4 traps. Card was awful all day, and every time I drew it I lost. That just about summarizes my experience. Shoutout to all my friends for letting me borrow cards and I’m sorry the deck didn’t perform better. Game 2 was strange. I pushed for some damage and set torrential in main phase 2. I thought I was safe, but then my opponent summoned Denko sekka. Why did he side in Denko? I have no idea. He didn’t even know I was playing Yosenjus, and on top of that I was only playing 4 trap cards in the entire deck. The Denko tech confused me, but it won him the game so I guess it was the right move. Opponent went first and opened very well. He negated my slumber with my body as a shield, which allowed me to use a second slumber. I flipped vanities during his standby phase and continued to beat him down with Jizukiru over the next several turns. Game 2 was almost exactly like the first. He summoned Drancia/Emeral and set backrow. He then negated my first slumber. I followed up with a second slumber. Poked for game. Very boring for both of us. He opens the sheep combo and sets double strike and barrier. GG. Game 2 he literally burns himself to death with all the strikes and instant fusions. Game 3 he plays into Needle Ceiling and Torrential Tribute. Then he activates Lullaby of obedience, calling Terrortop, and gets nothing. Then he messes up the rat combo. Despite his several misplays he still wins because I didn’t draw a single monster all game. In fact, the only monster I drew all MATCH was the Kama 1 in game 2. Game 1 I opened Twin Twister, for the first time all day! That card alone was enough to win. Game 2 I actually managed to otk with Slumber, Twin Twister, and Yosenjus. Despite playing a deck that was built specifically to otk, this was the only time all day that I actually drew into one of the several possible otk’s. This version of the deck failed miserably. It was 46 cards…much larger than any other variant I had made before. This diluted my chances of seeing cards like twin twister. In testing, the 46 card deck did not seem to be a problem since every card was something I was okay with seeing in my opening hand…if I also drew a monster with it. I don’t know what the odds of this happening were, but in the over 10 games I played, I drew almost no monsters and had to set fake backrow. Immediately after I dropped I decided to cut the deck down to 42 cards and play in a side event. The event was an 8 man (3 round) tournament similar to the last chance qualifier at nationals. He went first and make the ultimate providence-like monster and crystal wing with backrow. He had one card in hand (Aleister). I opened a kaiju, slumber, and barrage. He activated Maxx “c”, but I didn’t care and just pushed for game. Game 2 he goes first, but I open Artifact Lancea. Chaining lancea to his invocation let me otk him the following turn with the rat/tensu combo. He tried to stop my combo with artifact scythe, but I had chalice in hand. Game 1 he goes first and opens void feast. I deal with the double decatron with book of moon and slumber. Push for game with rat combo. Game 2 I open lancea and shut off his lawnmowing mills. I can’t otk on my turn so I make Rhapsody in Berserk and banish the threats he had in grave. He has no plays the following turn because everything good is gone and scoops his cards. Believe it or not, I played against a Yosenju kaiju player in round 3. He was bad though so it was a free win. I watched him play in a previous round and he thought that he could negate the draw effect of toy vender with vanity’s emptiness. Also I was tired and made a pretty bad misplay. The only monster on board was my Drancia. He activated slumber and I forgot to chain Drancia to pop itself to force slumber to fizzle out. Whoops. Also he sided flying “C” to stop my xyz summons. Chalice made flying “C” a non-issue. I ended up winning the side event (prize was a mat and an invite to the ARG invitational). Super small tournament means no glory. This was basically just another way to playtest changes to the deck. Based off the matchups I would say that the pure zoo matchup is more difficult that I had seen in playtesting. This is undoubtedly due to the amount of backrow they can set. Would cutting my deck size down improve this matchup for me? I would assume so, but haven’t tested yet. Seeing backrow removal is essential for my deck to function…as is seeing monsters. Bricking cost me the main event, but I think it was probably due to my own bad deck building. Smaller is better. Infernoids is the deck’s easiest matchup since noids play virtually no backrow. Paleo is impossible to beat. Main take-away: Reduce deck size. Add more backrow hate. Consider playing another deck at Brooklyn regional (maybe BA). Starter Deck 2017 is scheduled to be released in the Yu-Gi-Oh! Official Card Game on March 25, 2017. Along with new cards that will be featured in the upcoming Yu-Gi-Oh! VRAINS anime, the release of Starter Deck 2017 introduces changes to the rules of the game as well as the introduction of a new Summoning type, Link Summon. For many, what has just been stated is old news, and the introduction of the new rule changes have been met with mixed feelings from players. However, I will attempt to briefly address some of the ways the changes to the rules and the new Summoning method will affect game mechanics as well as mention some things we need to keep in mind when moving forward with the new rules. I will begin with the concept of “Extra Deck Monsters”. In order to help with adjusting to the new rules, I encourage you to think of monsters not as “Extra Deck Monsters” but as “monsters Summoned from the Extra Deck” and “monsters not Summoned from the Extra Deck”. Monsters Summoned from the Extra Deck must go into either the Extra Zone or a Main Monster Zone Linked to a Link Monster. Monsters Summoned from the Hand, Main Deck, Graveyard, or from being banished would be Summoned to any Main Monster Zone. It is permissible to Summon any monster into a Linked Main Monster Zone, not just monsters summoned from the Extra Deck. This does raise the question of how the Returning a banished monster to the field would work. For example: if I have a PSY-Framelord Omega which was Summoned from the Extra Deck and I use its effect which would involve banishing itself, could I place it in a Main Monster Zone that is not Linked? Official clarification would be required to answer this question, but my guess based on my understanding of how Returning a banished card works, is that the process of Returning seeks to preserve the game state as much as possible, therefore the Return of a monster Special Summoned from the Extra Deck must be to a Zone that it would be able to occupy based on the rules of the game. Therefore, if no available Extra Monster Zone or Linked Main Monster Zone exists for the PSY-Framelord Omega from the above-mentioned scenario is available; I would conjecture that the correct action would be that PSY-Framelord Omega would then be sent to the Graveyard, and not placed in a Main Monster Zone that is not Linked. With the introduction of Link Summoning, every single one of your monsters will count, even after they have been used as Link Summoning Material. Remember that Link Monsters can also be used as Link Summoning Material, and the indicated Link value of a monster also indicates how it can be used toward the Link Summon of another Link Monster. Keep the directional arrows that indicate which zones will be Linked by your Link Monsters in mind as each of those will play a part into how you can Link other Main Monster Zones. Link Monsters Summoned from the Graveyard into Main Monster Zones will still Link the Main Monster Zones which their arrows point to. So take advantage of cards that Special Summon monsters from the Graveyard, such as Soul Charge, and Link your Main Monster Zones so that you can utilize Fusion, Synchro, Xyz, and other Link Monsters. Take advantage of cards that allow you to summon multiple monsters at once, such as Brilliant Fusion, Zoodiac Barrage, and Blackwing – Gofu the Vague Shadow, in order to bring out Link Monsters as fast as possible. Cards such as Ground Collapse or Zany Zebra may have an interesting role to play when it comes to impeding additional Summons from the Extra Deck. Cards like Dimensional Barrier and Artifact Scythe will also be very strong as we can certainly expect Synchro, Xyz, and Fusion Summoning to become intermediate steps to Summoning the first Link Monster for any game. If you have any questions, please feel free to ask in the comments, and I will do my best to respond. Magic the Gathering “Competitive” EDH Primer: Grenzo, Dungeon Warden, Who pays for their creatures?! 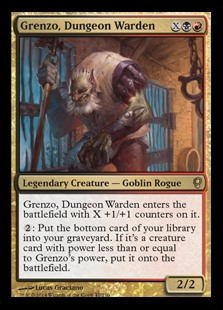 Grenzo, Dungeon Warden is a pretty strange card. He’s one of only three legendary creatures with an X in the mana cost. He is one of only two cards (that I know of) which interact with the bottom of the library beyond just putting things there. Also, his hands are bigger than his face, and he’s just funky lookin in general. So Wait, What Does Grenzo Do Again? Grenzo lets you pay two mana (at instant speed, and repeatedly) to put the bottom card of your library into play if it is a creature of lesser or equal power to Grenzo. Since he is an X spell, his power is equal to the mana you choose to pay, letting the selection of creatures you can grab scale with your investment. This suggests two strategies: either make Grenzo really big, and push out huge monsters on the cheap, or ensure that the creatures in your deck are small enough that even a mini Grenzo can get them. While the former is something I’ve tried in the past, I’ll be discussing the latter here. How Can We Win With Just Small Creatures? Pretty easily, as it turns out. In RB we have access to some pretty nasty creature-based combos, the simplest being Kiki-Jiki, Mirror Breaker + Zealous Conscripts. Oh wait, did I not mention? This is a combo deck. Yes, I’m one of those guys you heard about in the Kangee deck tech. If you didn’t want to read about that, you can stop here and go try to play Grenzo with Vampire Nighthawk or Herald of Leshrac or whatever. Are they gone? Cool. I lied about waiting. The other standalone combo we’re playing is Necrotic Ooze. Since we spend most of the game milling ourselves, and our curve is pretty low to begin with, the Phyrexian Devourer/Triskelion win isn’t very reliable. I’ve opted for Kiki-Jiki + Mogg Fanatic in its place. Tap Necrotic Ooze to copy itself with haste, rinse and repeat until you have half a billion Oozes, then sacrifice them all to ping people to death. I specify “standalone combo” here because there are numerous loops that require Grenzo to be in play, many of which have interchangable or surprising pieces. I will go over these in more detail later, but for now it’s sufficient to get the idea of what the deck is trying to do: flip through as much of the library as possible, stabilize a loop, repeat until you’ve won. Just Show Me the List Already. Fine, fine. You can find the most updated list on Tappedout here. When I activate Grenzo, I want a greater than 50% chance of it paying off. As such, I run over 50 creatures. Mana dorks are incredibly important to the deck’s strategy. Ramping by only one land per turn is not sufficient, so there needs to be some amount of creatures that give you consistent mana increases across turns. This is both so you can flip increasingly large numbers of cards (which get you more mana), and so you can cast actual spells while still holding up Grenzo activations. These creatures provide less reliable mana production, but generally in greater bursts. They allow you to flip more creatures in a turn than normal, leading to unexpected wins. Recurring resources is pretty important here, as bringing back a key combo piece from the grave is generally easier than trying to get a funcitonal copy from the library. Epitaph Golem is the sleeper hit here, in its repeatability and the sheer number of combos it enables. Sources of haste allow you to often play one turn ahead with mana dorks and reanimator creatures. If there’s one thing Rakdos is good at, it’s removal. This package is relatively small compared to what we could be playing; in a meta with more things like Linvala or Elesh Norn, I would definitely expand this list. 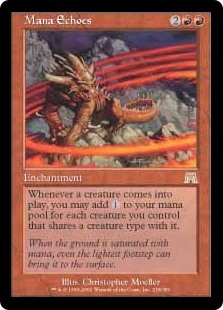 Some combination of these creatures is responsible for the vast majority of the deck’s wins. Again, I’ll give a more full list of combos later on. These guys are more generalized utility. The slots are pretty flexible, none are required for the deck to accomplish its plan. So there’s all your creatures. The non-creatures have to be pretty darn good to justify the slot, so I’ll address these individually. The most flexible removal in Rakdos. The only mana-efficient way to permanently deal with enchantments. Required. The spot removal I play needs to be either super flexible or so cheap you don’t need to pay for it. Fire Covenant and Snuff Out currently fill those roles. Pyroblast and Red Blast are really nice “gotchas” to have in your pocket. You could play both; I like just the one to keep the fear in ’em. None of the modes individually are good enough, but the flexibility lets this make the cut. 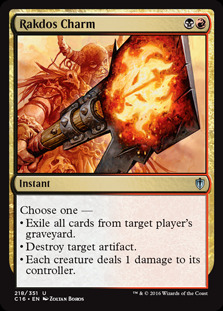 It has game against nearly any opposing combo, can shut off value engines, and blows up that nasty early game Sol Ring. Couldn’t ask for more. This one is something I’m trying out. The flashback on this is the only reason it’s here, since it’s more likely to hit the grave than it is to be drawn. 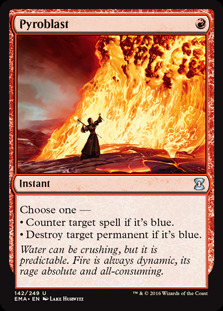 This should probably go in every red deck, honestly. Convert a creature into another flip. Seems fair, given that it’s roughly a 50% exchange rate with the deck’s composition, and it is fair, until you combine it with other cards. Just double your flips. That’s enough. The fact that I’m running Bracers should tell you how good Heartstone is. Fixes iffy draws, recovers you from certain doom, goes crazy with Skirge Familiar. This is banned in modern for a reason. Oh boy, this thing. It’s worth rephrasing exactly what this card does. Whenever a creature comes into play, on anyone’s field, you get one colorless mana per creature you control that shares a creature type with it. If it was your creature, you get one mana for itself. If you stack triggers such that more creatures come into play with this ability on the stack, you can start getting mana on the order of polynomials. This card is actually absurd. If you untap with it, you will almost always win. I’ve seen someone try to Reclamation Sage it down, only to win in response because I controlled a Shaman, and that gave me enough mana to kill everyone on the stack. Of all the cards in the deck, this is the single one that will win the game on its own. …What’s that? You say there’s one more? Oh… that one. If you can’t cast Grenzo as a 3/3, Mad Auntie will be in the pile. If you don’t have enough mana to burn the whole pile, Workhorse will be in there. If you need even more mana, Kiki-Jiki can copy Workhorse . If that won’t work for whatever reason, you have to think. Odds are you won’t have to think very hard. 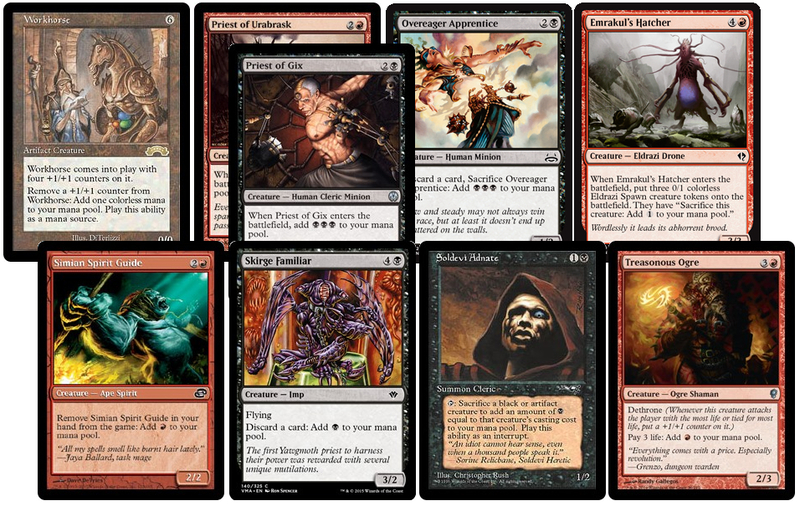 The only time I had to try when casting Doomsday, an errant Newlamog exiled a piece of every combo I had available. I could still find a way to win. I’ve found running about 32 lands to be good for this deck. It can’t afford to run too many real mana rocks, and there isn’t all that much card draw, so going below that is pretty risky. Too many, and you dilute your Grenzo activations too much. For the most part, this is the standard semi-budget Red/Black manabase. Notable inclusions are Cabal Coffers, which is pretty much only good if you accidentally the long game, and Temple of Malice, Spinerock Knoll, and Howltooth Hollow. These get their value from being able to stack the bottom of the library to some extent, allowing you to plan your flips in advance. The most obvious missing cards are tutors. Vampiric Tutor, Demonic Tutor, Gamble, Diabolic Intent, and more could all find their way into this list. As far as I’m concerned, they take a lot of the fun out of this deck, though. I’d never begrudge anyone for running them, but in a deck where the optimal play is almost always to tutor for Doomsday, then cast Doomsday, then win… No thanks. Many cards are excluded for budget reasons. 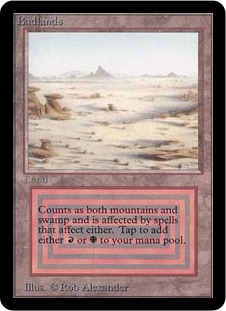 Badlands, fetchlands, Imperial Recruiter, and Mana Crypt are probably the biggest of these. None of them are really necessary, but all would be nice to have. With an average CMC of 2.94, Ad Nauseum is not at its best here, and even if it were included, drawing tons of cards actually helps surprisingly little. Mana is nearly always the biggest constraint under which the deck works, not cards. You can pick up this list for under $200. With a simpler manabase, it can still function reasonably well and drops to well below $150. Start dropping Bloodghast, Simian Spirit Guide, and a few others, and you can go even lower without significantly affecting the functionality of the deck. 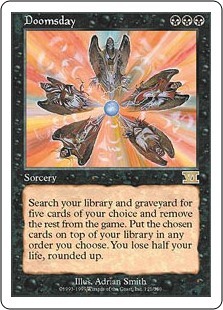 What I’m saying is, as far as commander decks go, this one is pretty darn cheap if you want it to be. Okay, I Didn’t Read Any of That. How Do I Play? Generally speaking, I’ll follow these guidelines when I play this deck. Always cast Grenzo for X=1, or three power. This lets you get everything in the deck except for Necrotic Ooze, which will probably end up getting reanimated anyway. Only cast Grenzo for X=2 if it doesn’t prevent you from activating an additional time, and even then probably not. Never activate Grenzo at sorcery speed unless you’re trying to win right now, or there’s a problem you can’t let someone untap with. You have instant speed interaction. Make sure your opponents know it. Even if you can’t bluff, it’s always possible to flip into something that opponents assess as a threat; it’s better to do this when they can’t answer at sorcery speed. Don’t always cast Grenzo as soon as possible. If you have stuff to do in your hand, it’s sometimes worth running out mana and utility creatures when they don’t have to compete with Grenzo activations. The longer Grenzo stays on the field, the more likely he is to die, and that can be a major tempo hit if you don’t have recovery options. Where’s That List of Combos You Promised? Sure, fine. This is a partial list. I’m constantly finding new combos and interactions. Ashnod’s Altar + Heartstone/Illusionist’s Bracers/Ogre Slumlord/Pawn of Ulamog = Every creature results in two more flips. Since we play over 50% creatures, on average this flips the deck, especially considering the creatures that add mana on their own. Epitaph Golem + Workhorse = Infinite ETB and death triggers. Epitaph + Workhorse + Ashnod’s Altar/Heartstone/Illusionist’s Bracers/Pawn of Ulamog = Infinite mana, flip your deck. Epitaph + Priest of Gix + Viscera Seer + Heartstone = Infinite mana, scry, every creature in your library. This Guy is Confusing. I Want to Play Something Else. Well, if you want something from Rakdos specifically, you might have a bad time. Playable legends are relatively slim in this color pairing, with the best options likely being Kaervek the Merciless and Rakdos, Lord of Riots. Yes, I know Vial Smasher is a card. I also know that it’s never just red/black, also shut up. Anyway, these clearly lend themselves to quite different strategies than Grenzo. 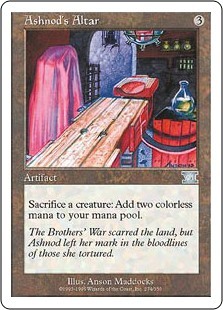 If you don’t like Rakdos, and I wouldn’t blame you, you can find similar abilities in Yisan, Alesha, Thrasios, and Mayael the Anima. All of these have their individual limitations relative to the Dungeon Warden, and their strengths. This Has Gone On Way Too Long, Wrap it Up. Grenzo, Dungeon Warden is a pretty cool guy. I’ve been playing him since I pulled the card in a Conspiracy draft over two years ago, and there’s always something new to find. Practically every set gives him new toys to play with, even for a relatively focused combo list like this one. The fact that I wrote just… way too much about this should make it clear how much I like this deck. It’s really cool. Thanks for reading, folks. If you enjoyed this, consider checking out my youtube channel 1600 Horsepower or my website here.